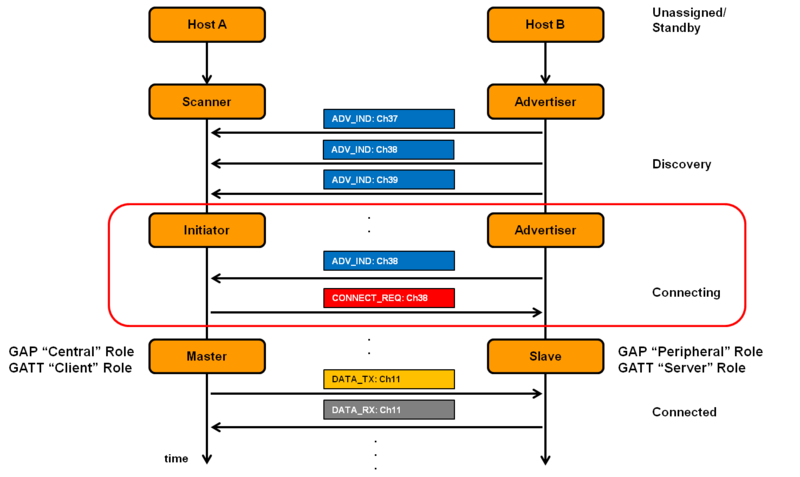 Once a Scanner has acquired enough information to decide which Advertiser to connect to (including its MAC address), it becomes an Initiator, initiating a Bluetooth® Low Energy (BLE) Link Layer connection process. The BLE Connection process is usually preceded by a Discovery process, so the devices are aware of each other's presence. BLE supports both Unicast (Peer-Peer) as well as Broadcast connections. This page covers the Unicast connection process. Time between two connection events. Number of consecutive connection events that a slave is not required to listen for the master (events are skipped only if it doesn’t have data to send). Maximum time between two received valid data packets before a connection is considered “lost”. Once connected, the Master/Slave exchange data packets at regular intervals, called "connection events".